It had done the hard yards through the Flinders Ranges and was resting, conspicuous among the macho, checkerplate-clad RV warriors in the shadow of the Heritage-listed Marree Hotel at the junction of the Oodnadatta and Birdsville tracks. But even here, seasoned Australian caravanners were still reluctant to take the latest Bailey Verona GT65 seriously. From its soaring polyplastic double-glazed front window, to its sleek, laminated and moulded five-part body shell, lightweight pressed-steel chassis, single-axle, and small 195 section 15in light truck tyres, to its sleek black metallic VF Commodore SV6 Sportwagon tow car, it had ‘city slicker’ written all over it. Yet it was in one of Australia’s iconic outback towns, apparently no worse for wear apart from a light film of road dust on its floor and benchtops, and offering more inviting and luxurious lodgings for the night than any other structure in town. It may take Australians more than the two years that the UK-built Baileys have been on sale here to really ‘get’ them, but Bailey Australia is working hard to fan the winds of change. The small but distinctive ‘Made for Australia’ sticker on its vans’ flanks and moulded rears says it all. British Baileys receive more than 50 separate modifications before they go on sale in Australia, a serious commitment to this market from a company building around 9000 caravans a year, nearly half our total van and pop-top market. Some of these are mandatory requirements concerning gas venting and wiring, but many are changes made specifically for Australian conditions based on customer and media feedback and include uprated axles and better insulation to the roof and body sides to cater for our roads and climatic extremes. 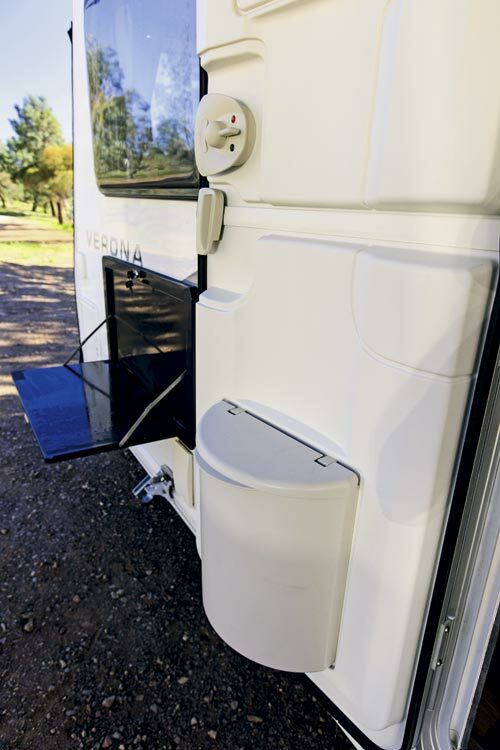 The latest and best example of this determination to make the Bailey an ‘Aussie’ van is the new, low profile twin 65L water tanks with an inbuilt level gauge fitted to our review Verona. Baileys sold to the UK and European markets don’t come with sub-floor tanks. Instead, they plug into mains water and have a 23L portable tank for emergencies and a cuppa on the road. The first Aussie Baileys had a single 70L tank fitted but it hung vulnerably low with the same small ground clearance as the previously underslung spare wheel cradle. With its 2014 vans, Bailey relocated the spare wheel higher in between the Al-Ko galvanised pressed-steel chassis rails, leaving the water tank even more exposed, but now Bailey Australia has had twin, low-profile 65L polypropylene tanks designed and made in Australia. Both sit high within the chassis, increasing total water tank capacity to 130L and dramatically improving ground clearance. And because many Bailey owners will want to free-camp in comfort, or travel to areas without 240V power, the Verona now has a locally sourced Truma E2400 gas-only central heating system instead of the 240V/gas Alde European system fitted previously. An Aussie Traveller awning, Aircommand Ibis reverse-cycle air-conditioner and Thetford fridge and cooker are among the many other locally-sourced items. Finally, all new Baileys now come with the latest Jack HDTV low-profile digital antenna, which we know from experience will find a good signal within seconds at every stop. Other changes to Australian Baileys were made following Caravan World’s review of the similarly-sized single-axle Unicorn Valencia earlier this year. These include a much sturdier (optional) padded front body bra, an external grab rail for safer entry and exit, more 240V and 12V power outlets, an external gas barbecue point, a new shower module, more robust fixing of wardrobe hanging rails, and better flyscreens and window blinds to deal with Aussie mossies and our harsh sunlight. It might have looked like a fine British pork banger at an Aussie barbecue, but the Verona and its VF Commodore tow car felt very comfortable in outback SA. 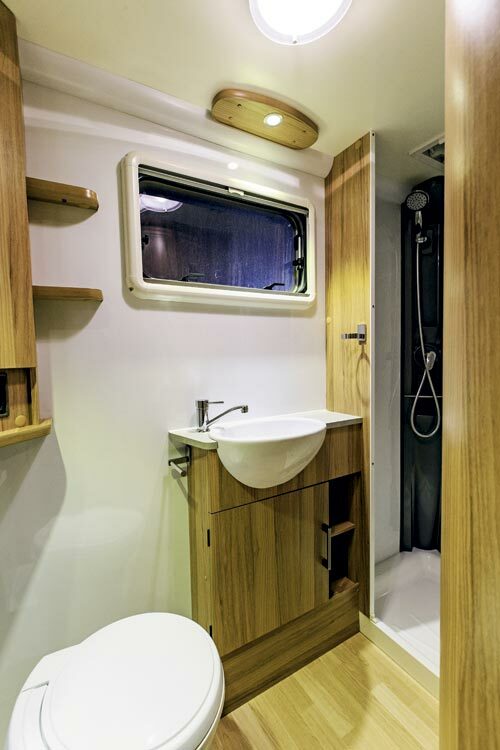 The 18ft 8in (5.71m) internal length Verona is a fully-featured caravan that sits in the mid-range of the Bailey Australia line-up. 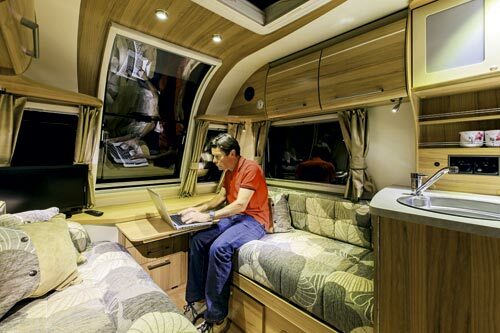 It is Bailey’s largest single-axle model, yet those comparatively skinny tyres give a false impression of fragility – in reality, they are a plus for long-distance Aussie touring. A single-axle means less unsprung weight and more manoeuvrability than a tandem-axle, and this also applies to the wheels and tyres, with the latter having a simple radial pattern designed to keep the Verona tracking straight at speed. The Verona certainly felt solid on both bitumen and loose surfaces behind our Commodore, with the ‘safety belt’ of its standard Al-Ko ATC (mechanical trailer control system) on standby to correct swaying. Viewed from a following vehicle, the van’s springing seemed a little firm for its weight, with the wheels hopping a little on bitumen bumps, although the only thing felt from behind the wheel of the Sportwagon was the occasional gentle intervention of the ATC when hitting cattlegrids on an angle. 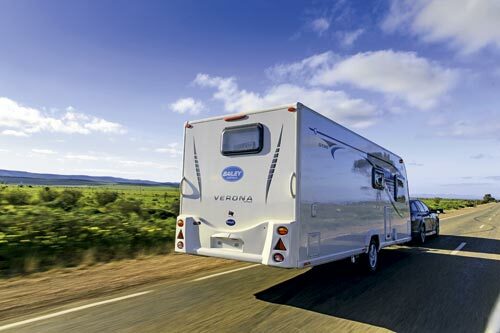 Living with the Verona is easy but different to a typical Australian caravan. 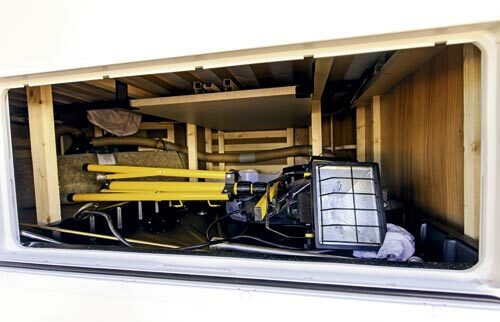 For example, there are two good storage hatches on the nearside of the caravan – one extending into the cavern beneath the north-south queen-size bed – but the single locker on the offside is strictly for the 9kg gas cylinder. The centre entry door is also a two-part, top-and-bottom affair, with a waste bin incorporated in the lower half. But instead of a classic swinging flywire door, there’s a flexible flywire screen that pulls out of a body cavity. I’ll lay odds that someone unfamiliar with the system will walk through it! 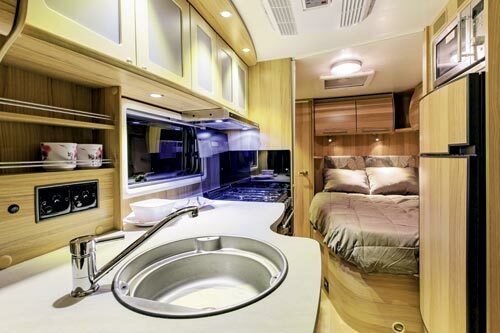 Inside, the Verona has the same wow factor as all Bailey caravans, with the huge front window dramatically bringing the outside in. Even better, the window, and its adjacent and similarly double-glazed side windows, can each be opened to create a delightful breezeway, with both flyscreens and block-out blinds sliding out of the window surrounds to shield the insects, light, or both. The front lounge is not only a delightful place to relax, it also works as a dining room for six when the supplementary table, with its folding legs, is removed from under the bed and installed, augmenting the small coffee table that pulls out from the chest of drawers at the head of the van. Or if you have friends, you can convert the front area into a king-size bed by extending the slatted base from under the twin lounge seats and rearranging the cushions. The kitchen does not have lots of bench space but it’s still very workable, with its protruding circular sink and large tap on one side, a four-burner Thetford Caprice cooktop with griller and oven below on the other, and a serving bench with a drawer and cupboard in between. All drawers now have a soft-close action for 2014. On the other side, the 190L Dometic AES fridge-freezer handles all your fresh food storage needs, but the Daewoo microwave built into the cabinet above is quite high. Attractive, curved timber upper cupboards line the lounge, while there is ample storage for glasses in the cupboards above the kitchen. 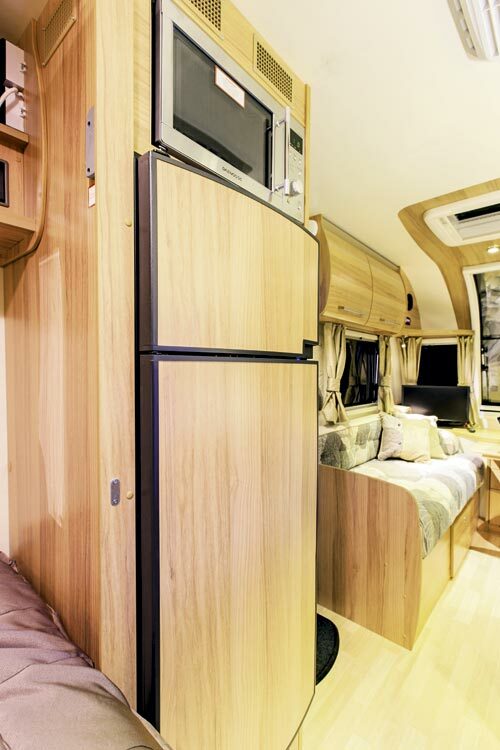 The Verona’s layout is another point of difference, with the bed flush against the nearside wall. I really like this layout as it allows plenty of room to get past the bed to the separate rear ensuite. The downside, however, is that the person sleeping next to the wall needs to crawl across the bed to get in and out. So what’s not to love above the Verona? Surprisingly, not a lot. Some may worry that the standard Catria fabric (or optional Amaro) soft furnishings with coordinated curtains and cushions may mark easily, but from our experience we don’t believe that will be a problem. I did worry about spills from the sink and its lipless surrounding serving bench onto the lounge, but, hey, isn’t that what 3M fabric treatment is for? 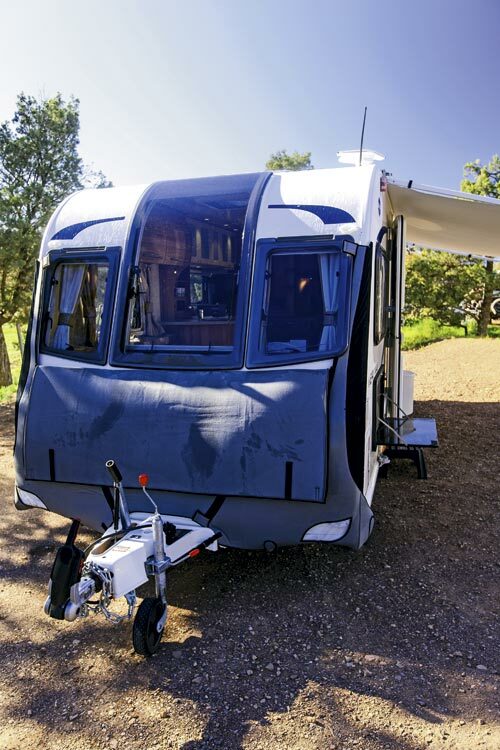 The bottom line with the Verona is that you get a caravan that punches above its weight in size and features, without necessarily having to upgrade your tow car. At $57,289, it’s an attractive proposition. As editor Max Taylor accurately observed during a recent caravan review, the worst part of the day after any long stretch of dust or corrugations is when you open the caravan door and fear what you might find. In the case of the Bailey Verona, it was a mixed bag, but mostly good. By Marree, halfway through our five-day test, there was little to report. Nothing had moved, broken, fallen open, or fallen off. The only evidence that we had travelled around 800km from Adelaide via the Flinders Ranges and mostly on dirt from Lyndhurst, 80km to the south, was a light film of road dust on the floor and benchtops. We initially worried about ground clearance through some of the shallow river crossings in Parachilna Gorge, which took us 66km from the end of the bitumen at Blinman to the popular Prairie Hotel, but we didn’t even come close with the Verona, and even the low-slung Sportwagon, with 100mm of ground clearance but less than 100kg on its tow hitch, was never troubled. 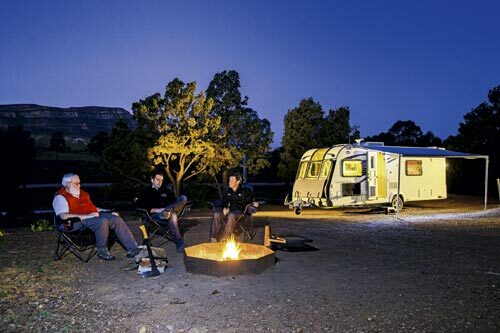 At Marree, Adrian Van Geelan, the managing director of Caravans Australia, was both delighted and disappointed. The main purpose of the trip was to determine how the ‘Poms’ fared off the blacktop compared with their Aussie opposites. By this stage, there was no discernible difference, other than the lower fuel bill for the petrol V6 Sportwagon, which had averaged 15.3L/100km since we left Adelaide, compared with the Nissan Pathfinder 550 V6 diesel, which used 17.5L/100km towing the 2t single-axle Regent Cruiser the same distance. In particular, the Verona proved itself capable of tackling made and unmade highways, and also of getting into more demanding territory off the road near the Farina ruins. By the end of the next day, when we arrived at Arkaroola Wilderness Sanctuary in the Northern Flinders Ranges, the dust from 130km of generally good gravel had become more noticeable in the vans, but the Baileys really fared no worse than the Regents. In fact, one Regent took in more after a propriety magnetic catch failed on a door under the oven and fell open, allowing dust trapped in the cupboard to spill onto the floor. Still, after 10 minutes with a dustpan and damp cloth, each van was ready to sleep in. However, after the following rough and very dusty 160km stretch from Arkaroola to Blinman, we had a more serious dust problem, with the two Baileys shipping somewhat more than the Regents. 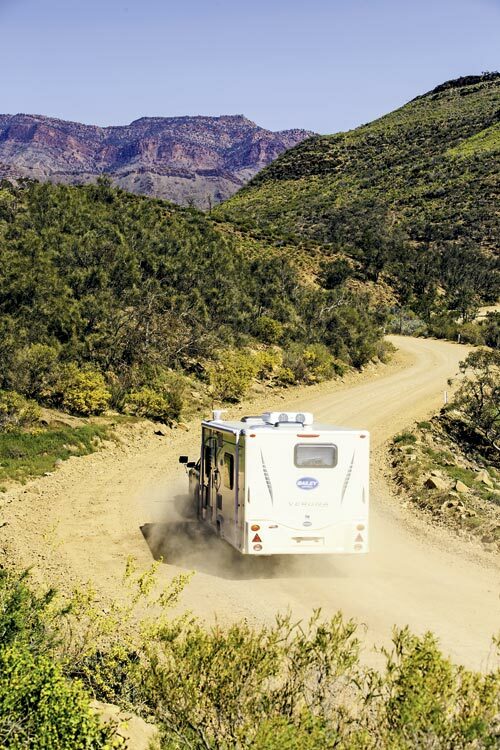 Dust ingress is an inescapable part of Australian offroad travel, partially due to regulations that require vans to vent to the outside if fitted with gas appliances, but some manufacturers have found ways to minimise the dust problem. 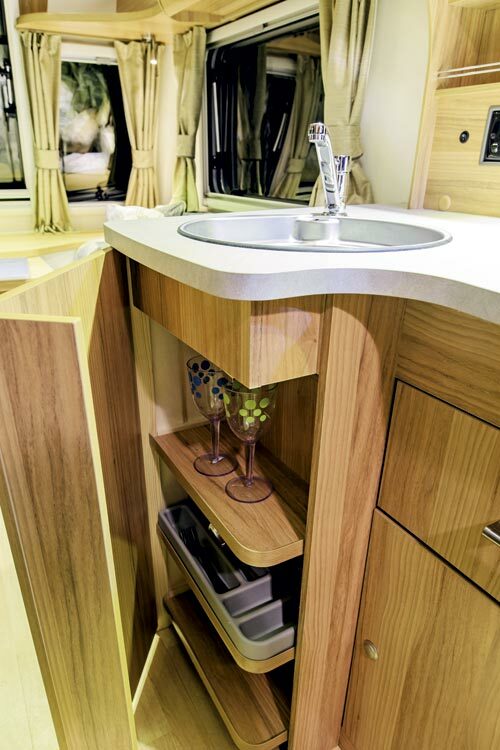 Being designed for British and European touring, where dust is rarely an issue, the Baileys had more holes and vents, allowing dust to find its way from cupboard to cupboard, whereas the Aussie vans generally limited its intrusion to areas around the kitchen. But Adrian was not dismayed. 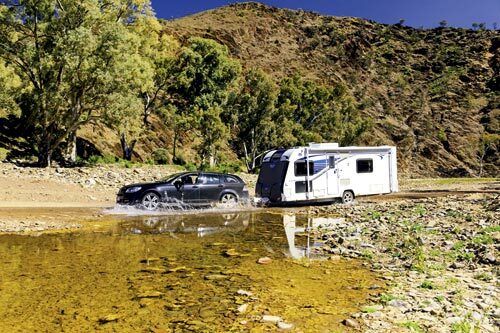 “We always tell customers that Baileys are luxury caravans designed to take you around Australia on the bitumen, but they can follow a standard passenger car on good, unmade roads to access campsites or points of interest. It’s all about common sense,” he said. 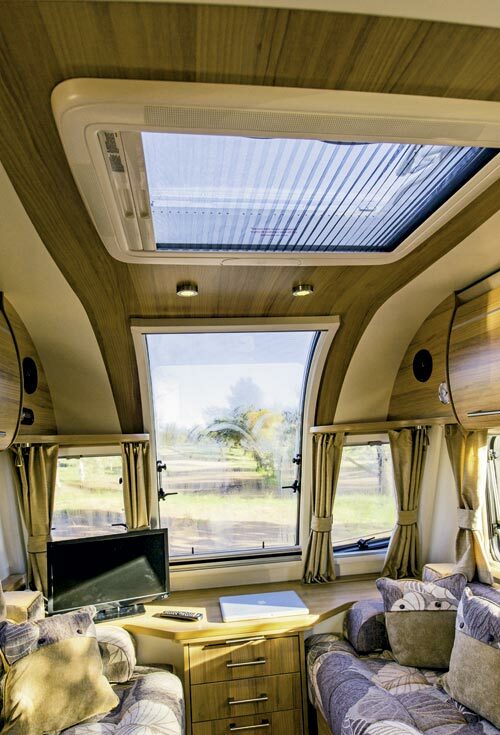 Having said that, Adrian’s experience on our trip and the presence of Bailey Australia marketing manager Boyd Kimpton is sure to lead to improved dust sealing in Bailey caravans. 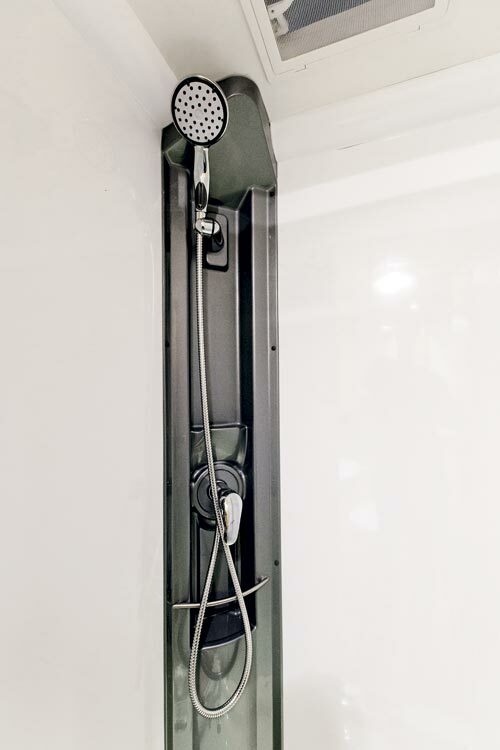 A roof-mounted pressure hatch, plus some cupboard-to-cupboard silicone sealing are obvious and simple solutions.